Ron Moses of Alexandria gets his day in the sun Monday as Mike Wolfe, right, and Frank Fitz, left, stars of History Channel’s “American Pickers,” visit his man cave to wheel and deal for his antique toys and vintage advertising signs. As a picker, Ron Moses, 63, can find almost anything. For more than 30 years, he has been scouring the highways and byways of America buying the rare or unusual and turning it over for a profit. Picking is the art of purchasing antiques, collectibles or other objects with the knowledge that you already have a buyer in mind who will readily pay you a profit for the item. And recently, Moses got picked. 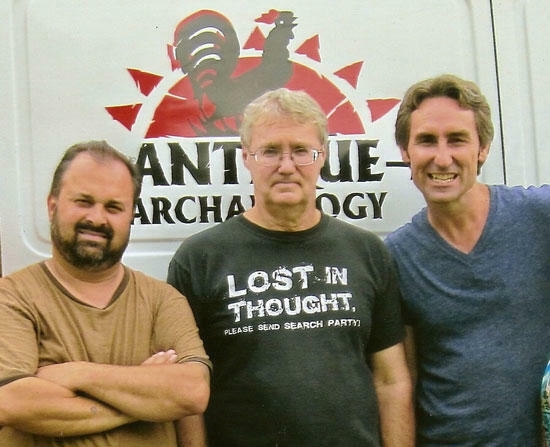 The wheeler-dealer, who lives in the DeKalb County village of Alexandria, appears with Mike Wolfe and Frank Fitz, the stars of “American Picker,” at 8 p.m. Monday on History Channel. Among other items, Moses digs arcade machines, pinball machines, jukeboxes, advertising signs, soft-drink machines, gas pumps and robots. His greatest joy may be in his collection of more than 350 toy robots. He recently made a deal for a metallic co-star of a 1960s TV series. “They both really wanted to see my ‘Lost in Space’ robot, but I didn’t have it when they came,” said Moses. How did he come to be on the show? Besides the two stars, a crew of 15 were present for the 5?-hour taping at Moses’ place. That likely will be edited down to the best five or 10 minutes for the show. “I thought Frank was more outgoing about talking to you about your stuff. Mike was more business-minded, checking things and going over them real good,” said Moses. Mike Wolfe owns Antique Archaeology, a shop that sells antiques, vintage items and folk art in Le Claire, Iowa. Last year he opened a second store in Nashville. He also has a second home in Leipers Fork in Williamson County. Moses sold the guys four items (we’re keeping what they were a secret) and says, “They got ’em a little bit cheaper than I wanted, but it was all right. “I had a Mobil sign that Frank wanted to buy. I was going to sell it for $100 because the corners were cut off. Frank only wanted to pay $75. He wanted to play me in Foosball [over the $25 difference], but I knew he was really good at it. So we played pool. I did beat him, but he was a pretty good player. It’s hard to beat a guy on his own court,” said Alexandria’s all-American picker.